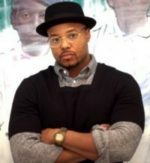 My friend and colleague Louise North recently commended to my attention an American artist named TITUS KAPHAR. Indeed, upon examination, I find his work fascinating as it frequently deals with history—myth and misremembered—often focusing on the dark sides of events and those we revere as heroes. His paintings are frequently three dimensional or sculptural in nature; there are often layers which peeled away reveal previously hidden or unacknowledged facts or qualities. I’ve come to realize that all reproduction, all depiction is fiction – it’s simply a question of to what degree. As much as we try to speak to the facts of a historical incident, we often alter those facts, sometimes drastically, through the retelling itself. Understanding this has given me the freedom to manipulate, and change historical images in a way that recharges them for me. Knowing that artists throughout time who have attempted to retell history have always embraced, whether consciously or unconsciously, a degree of fiction, in order to achieve the sentiment of the facts is liberating. 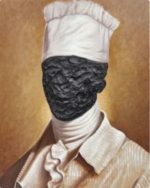 Kaphar credits his art history education at Yale with fostering his belief that “obvious oversights in the canon were regularly understated, suppressed or ignored.” He set out to challenge the viewer, to probe beneath the surface, to gain new insights into the character of his subject. Two paintings strike me as especially provocative since their subjects have figured in this blog. We sometimes forget that George Washington, the father of our country and acknowledged as its greatest president, was an active slaveholder. When he died there were 317 slaves at Mount Vernon, more than half of whom were dower slaves from his wife’s estate. Kaphar’s image reminds the viewer of this. 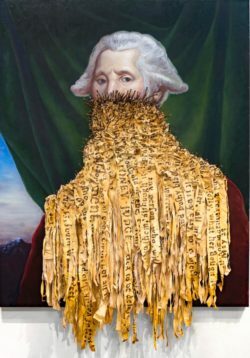 The lower half of Washington’s face is masked by streamers attached by (real) rusted nails imprinted with names of slaves and excerpts from ads placed for their recovery. The work’s title “Absconded,” in all likelihood refers to the slave whose name features prominently, one Oney Judge, who in fact did escape and fled to New England. In spite of Washington’s efforts, she was never recovered. The Washingtons could not understand why slaves who were not mistreated would want to be free. See posts about Oney here, here, here, and here. Another slave who also absconded was Washington’s chef, Hercules. Kaphar’s dramatic representation in tar and oil on canvas obscures Hercules’ face; he’s just another slave forgotten by history. See blog posts on Hercules here and here. Compare what is thought to be a portrait of Hercules by Gilbert Stuart with the depiction by Titus Kaphar. Read the entire interview with Kaphar HERE. 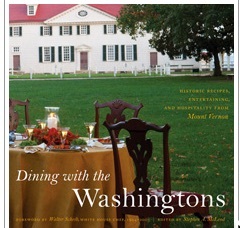 Since recent posts have be concerned with the slave Hercules, George Washington’s highly regarded chef who escaped, I thought I would bring to your attention a book describing how the Washingtons’ dinner table might have looked and what the menus were likely to have included. Dining With the Washingtons, Historic Recipes, Entertaining, and Hospitality from Mount Vernon edited by Stephen A. McLeod and published by the Mount Vernon Ladies’ Association contains many beautiful photographs of table settings, prepared foods, and gardens at Mount Vernon as well as informative essays and several recipes. With Valentine’s Day coming up as well as George Washington’s birthday you might want to prepare a cherry pie. (The “I cannot tell a lie” story about George chopping down the cherry tree is a myth invented by Washington’s biographer Mason Weems.) See the recipe here. Apropos the recent controversy over the depiction of Hercules, the cook in the household of George and Martha Washington, in A Birthday Cake for George Washington (see previous post), here are some additional interesting details about Hercules. The Philadelphia Inquirer published an article on January 23, 2016 describing work on the President’s mansion at Sixth and Market Streets in Philadelphia that uncovered the kitchen where Hercules worked. Ironically it is located just in front of the new Liberty Bell Center. Also cited is a farm report from Mount Vernon that shows that Hercules “absconded” on Washington’s birthday in 1797. Louis-Philippe, the future king of France, visiting Mount Vernon in the spring of 1797 recorded in his diary: “The general’s cook ran away, being now in Philadelphia, and left a little daughter of six at Mount Vernon. Beaudoin ventured that the little girl must be deeply upset that she would never see her father again; she answered, ‘Oh! Sir, I am very glad, because he is free now. '”* How did Louis-Philippe know that Hercules was in Philadelphia? Perhaps Washington said that he suspected that was the case. Hercules was never recovered. In his will Washington specified that the slaves he owned be manumitted. After his death in 1799, Martha saw that his wishes were carried out. So Hercules became legally free although he did not know it. In 1801 Martha Washington wrote a letter to Richard Varick in New York indicating that she had learned that Hercules was in New York. ** But nothing more was ever heard again of Hercules or his whereabouts. The portrait shown is by Gilbert Stuart and is thought to be of Hercules. It is in the Thyssen-Bornemisza museum in Madrid. Who commissioned it is a mystery. 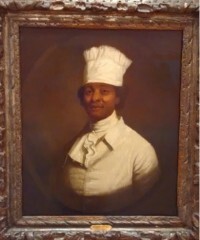 Would George Washington have wanted a portrait of his cook who was a slave? Could Hercules himself have commissioned it? It has been suggested by James Wemberley that the portrait ought to be in the White House Collection and that Michelle Obama might undertake to acquire it. I like the idea. See Wemberley’s article on a possible exchange. * Louis-Philippe, Diary of My Travels in America, translation by Stephen Becker (New York: Delacorte Press, 1977), p. 32. ** Martha Washington to Col. Richard Varick, 15 December 1801. “Worthy Partner:” The Papers of Martha Washington, Joseph E. Fields, ed., (Westport, CT: Greenwood Press, 1994), pp. 398-99.